Samsung has just introduced its very first smartphone with four rear-facing cameras, the Galaxy A9 (2018). As expected, this is a mid-range smartphone, even though it belongs in the upper-mid-range sector. The Galaxy A9 (2018) is not only Samsung’s first smartphone with four rear-facing cameras, but first in general. This handset resembles a number of devices the company had released thus far, at least from the front, and it actually has plenty to offer, so let’s kick things off by talking about its spec sheet, shall we. The Samsung Galaxy A9 (2018) features a 6.3-inch fullHD+ (2220 x 1080) Super AMOLED Infinity display. The device is fueled by the Snapdragon 710 64-bit octa-core processor clocked at 2.2GHz. This is one of Qualcomm’s most powerful mid-range processor, and it’s made using a 10nm manufacturing process. The Galaxy A9 (2018) comes with 6GB / 8GB of RAM and 128GB of expandable storage (expandable up to 512GB via a microSD card). The Galaxy A9 (2018) comes with two SIM card slots, and this is a hybrid dual SIM setup we’re looking at here, which means that you can use its second SIM card slots in order to insert a microSD card, and expand the phone’s storage. Android 8.0 Oreo comes pre-installed on the device, while a 3,800mAh battery is also a part of the package (support fast charging). The Galaxy A9 (2018) comes equipped with 24-megapixel (f/1.7 aperture), 10-megapixel (f/2.4 aperture, wide-angle lens), 8-megapixel (f/2.4 aperture, 120-degree wide-angle lens), and 5-megapixel (f/2.2 aperture, depth sensor) rear-facing cameras. A single 24-megapixel camera (f/2.4 aperture) is included on the phone’s front side. The phone features a rear-facing fingerprint scanner, while it comes with Bluetooth 5 and an NFC chip. The device measures 162.5 x 77 x 7.8mm, and weighs 183 grams. 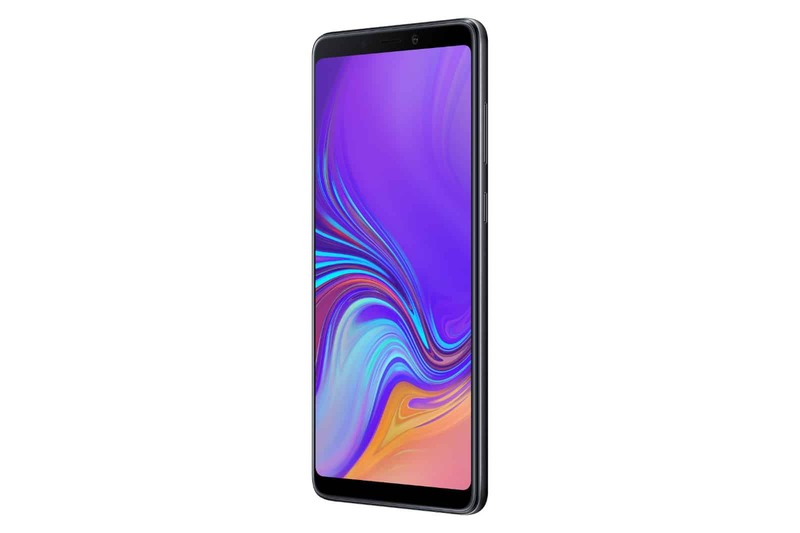 The Samsung Galaxy A9 (2018) is made out of metal and glass, same as some of the company’s more expensive offerings, like the Galaxy S9, S9 Plus, and Note 9. The Galaxy A9 (2018) comes with a curved back, but it does not sport a curved display, even though curved glass is included on top of that display. A fingerprint scanner is located on the back of this phone, and Samsung’s logo lies right below it. The phone’s cameras are vertically-aligned, while an LED flash sits right below them. A 3.5mm headphone jack is included on the bottom of the device, along with this phone’s loudspeaker, and a charging port. The device features rounded display corners, while its power / lock and volume up / down buttons are placed on the right. The phone’s dedicated Bixby button sits on the left. The device got announced in Caviar Black, Lemonade Blue, and Bubblegum Pink color variants. 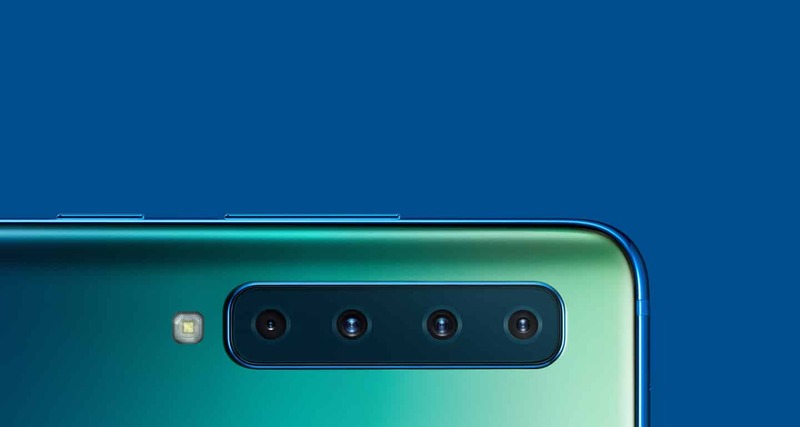 The Galaxy A9 (2018) has five cameras in total, but four of them are located on the back, and act as the device’s main cameras, basically. The Galaxy A9 (2018) sports 24-megapixel (f/1.7 aperture), 10-megapixel (f/2.4 aperture, wide-angle lens), 8-megapixel (f/2.4 aperture, 120-degree wide-angle lens), and 5-megapixel (f/2.2 aperture, depth sensor) rear-facing cameras, while a single 24-megapixel camera (f/2.4 aperture) is included on the front side of this smartphone. You’re not only getting a telephoto sensor for lossless zoom here, but also an ultra-wide sensor so that you can capture everything into a frame without moving further apart from your subject. Depth perception should also not be a problem for the Galaxy A9 (2018), as it sports a dedicated depth camera. The Galaxy A9 (2018) does sport a rather large display, a 6.3-inch fullHD+ Super AMOLED panel, but it also comes with a 3,800mAh battery in order to keep the phone active for the duration of your day. For comparison’s sake, the OnePlus 6 sports a 6.28-inch fullHD+ OLED panel, and a 3,300mAh battery, so it’s battery lacks in capacity (by 500mAh) compared to the Galaxy A9’s unit. Now, the phone’s battery can be recharged fast, as the company bundles in a quick charger, but do keep in mind that we’re looking at Quick Charge 2.0 speeds here, nothing earth-shattering. Android 8.0 Oreo comes pre-installed on the Galaxy A9 (2018), but on top of it, you’ll find Samsung’s custom Experience UI, of course. Now, as part of that UI, you’ll be getting a number of Samsung’s apps, like Samsung Pay and Bixby, whether you like it or not. Samsung’s Android UI also looks considerably different compared to stock Android, so keep note of that too. Android 9 Pie-based Experience UI is in development, and it will be coming to the company’s flagship phones soon, and the Galaxy A9 (2018) will receive it at some point as well, hopefully before the end of the year, but who knows. In terms of storage, the device offers quite a bit of storage (128GB), but you can expand that by a microSD card up to 512GB, which means that you can get 630GB of storage altogether, minus the system, and that’s more than enough for the vast majority of consumers. IN its press release, Samsung has announced that the Galaxy A9 (2018) will go on sale in November. The company’s UK branch did tell us that the device will hit the UK in November, and that it will cost £549, but we do not have any specific info for other markets. The device is expected to arrive in the rest of Europe as well, while the US may be a potential market for it as well, but nothing has been confirmed just yet, but rumors are claiming that the phone’s pricing will start at €599 in Europe, which makes sense compared to the phones UK price. If the phone makes its way to the US, its price tag will probably be around $599.